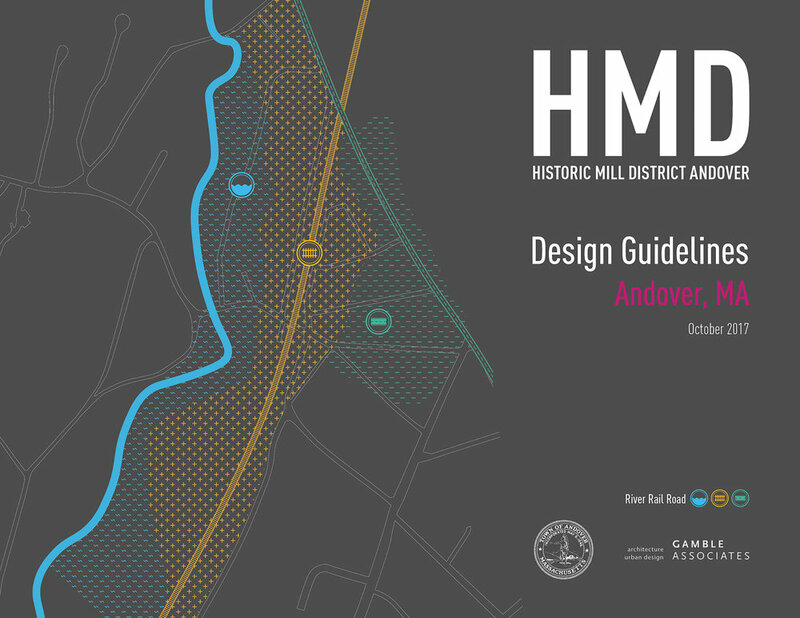 At Town Meeting in May of 2015, Andover voters approved the creation of the Historic Mill District (HMD). This new zoning district encompasses nearly one hundred (100) acres in downtown Andover. The purpose of the HMD is to encourage smart growth development in proximity to Andover’s regional transit station by fostering a range of housing opportunities within mixed-use development projects. 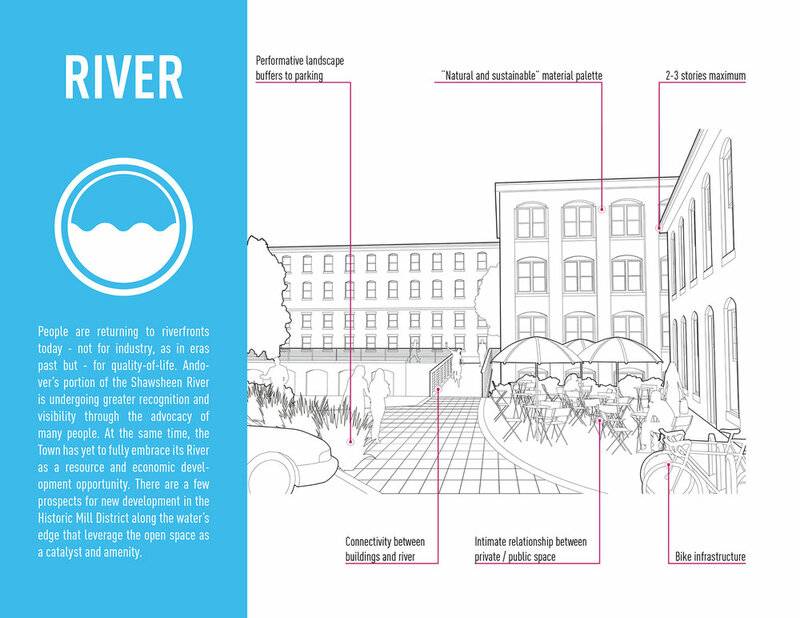 The goals of the design guidelines are to preserve and augment the Historic Mill District’s architectural qualities, historic character and pedestrian scale. To incorporate the different characteristics of the areas lying in the HMD, the design guidelines are organized into three different corridors: River, Rail, Road. 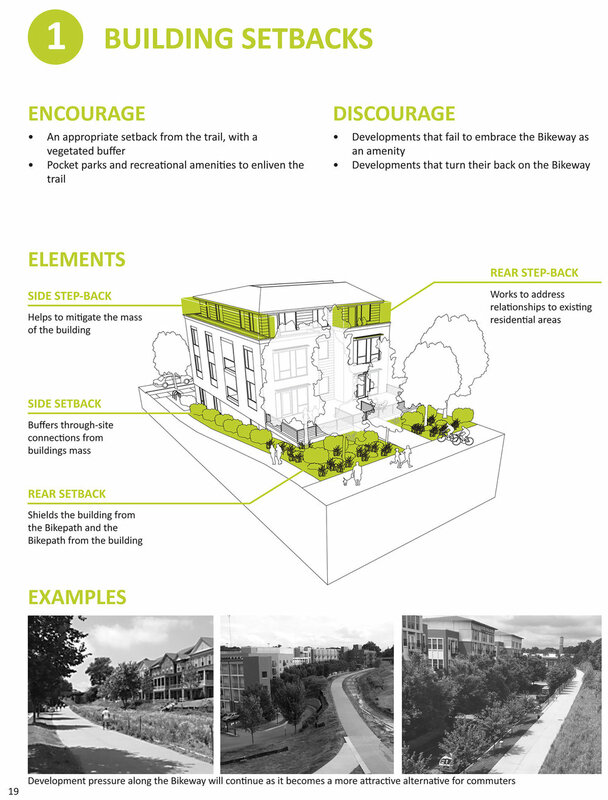 Development along the River corridor should be less dense and preserve its natural environment while the design guidelines encourage higher building elevations and density along the Rail corridor to take advantage of the nearby commuter rail station. Hartwell Avenue is a 1.5 mile long corridor that consists of mostly office and lab buildings that face the same issues as many other properties in similar suburban settings: Their location is too far set back from the street edge, they are surrounded by surface parking and lack attractive amenities as well as flexible floor plates businesses need today in order to compete. Response In order for Hartwell Corridor to survive, it has to become an attractive location for companies that are more and more moving to downtown locations. The corridor study recommends zoning changes that allow for greater density, higher buildings, and lower parking ratios. Combined with extensive streetscape improvements, Hartwell Avenue can be transformed into a mixed-use district that is connected to its adjacent open space potentials by an enhanced trail network. Faced with the possibility of a community-led moratorium on new development, Watertown initiated Design Guidelines and Standards for new development along the Town’s primary commercial corridors. The Guidelines were developed as the first implementation step which resulted from Watertown’s Comprehensive Plan that sought to concentrate redevelopment along corridors that have access to public transit. Response Nine over-arching categories for development organize the topics. 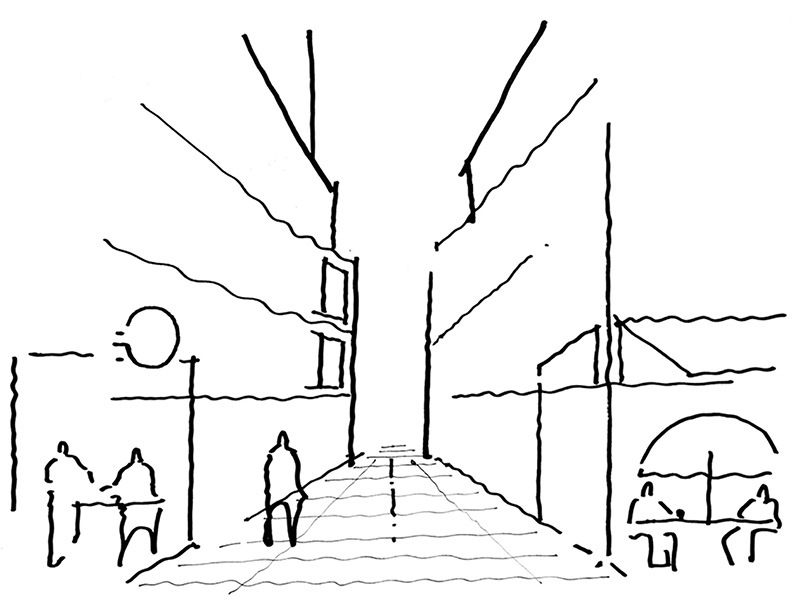 Three dimensional computer models, created using an intentional range of architectural languages, describe the characteristics in perspective form and highlight permissible and discouraged strategies as they relate to essential building elements like height, massing and public realm interface. 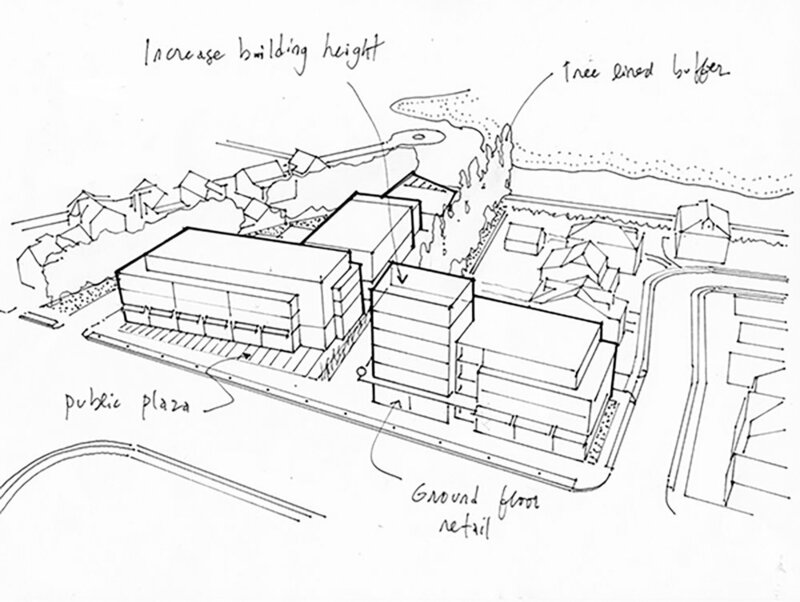 In addition to the guidelines, the scope of work included drafting language to be integrated into the Zoning Ordinance and collaboration with Greystar - a national housing developer - to test the application of the guidelines to a specific, 288 unit mixed-use complex. Dedham Square has a remarkable history. The downtown has a robust mix of uses that include over 18 restaurants or places to eat in close proximity to one another. Over the last few years, recent construction is filling in the gaps between historic buildings and raising the level of discourse about what the future of Dedham Square should look like. Response There is a perception that the Town is built out. However, there is still room to grow. Certain parcels close to Providence Highway are underutilized and would benefit from greater density and a more robust mix of uses. 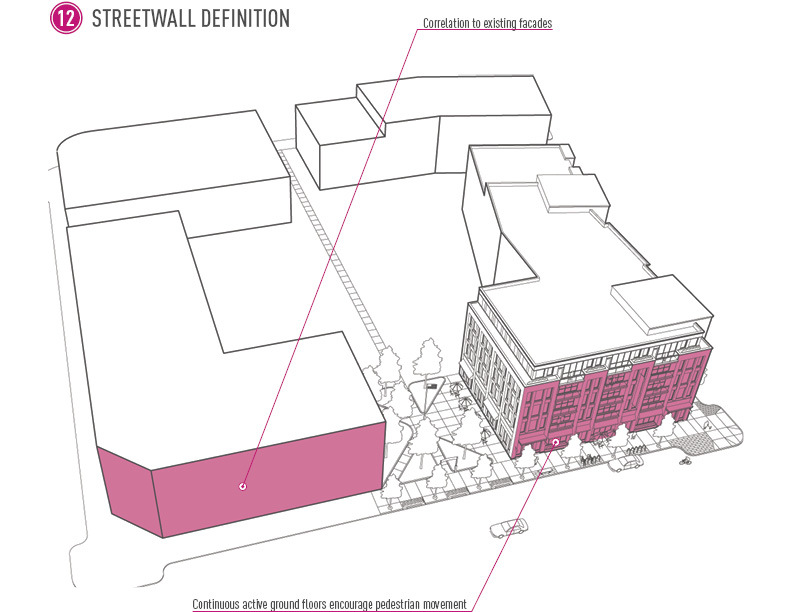 Paradoxically, potential areas for new growth are also close to the historic building fabric. There are five blocks that are nestled between the historic buildings and the highway which are best positioned for redevelopment. This is where Design Guidelines will have the biggest impact. The seam between the Stamford Hospital and the West Side’s primary commercial corridor is under development pressure as the medical campus grows. 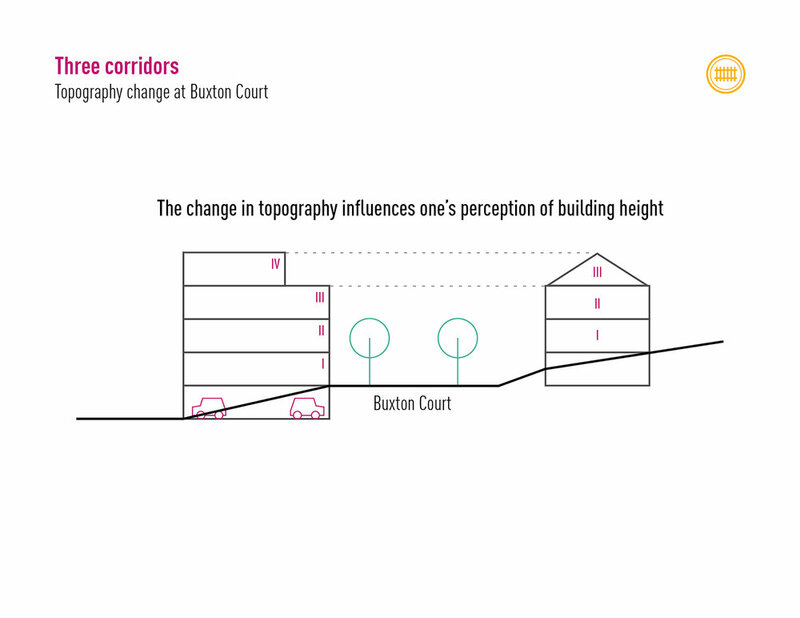 Recently adopted zoning changes for the city’s commercial corridors seek to establish a more urban condition for new infill development by increasing building heights and diminishing setbacks. This “Illustrative Guide” to redevelopment along Stillwater Avenue tested the capacity for new development under the City’s recently adopted Village Commercial District Zoning. 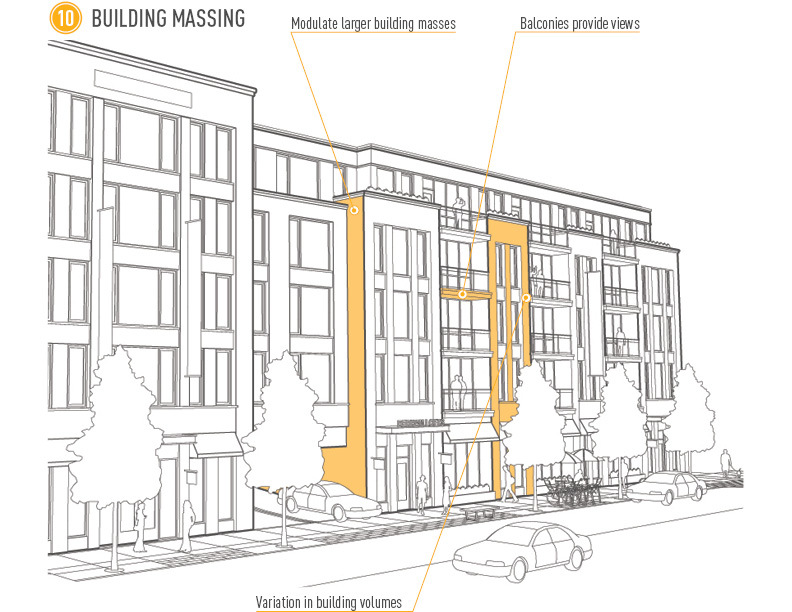 The rezoning effort sought to create a more pedestrian-oriented environment for the area and increase the viability of a mix of uses, including significant residential concentrations. The corridor plan capitalized on existing community assets and open spaces. In order to transform Attleboro’s downtown, the city has invested heavily in its public infrastructure: improved sidewalks, a regional bus station and new roads have drastically changed Attleboro’s image. South of downtown the city built a new park and access road (Riverfront Drive) next to 15 acres of underutilized land that is poised to be redeveloped. 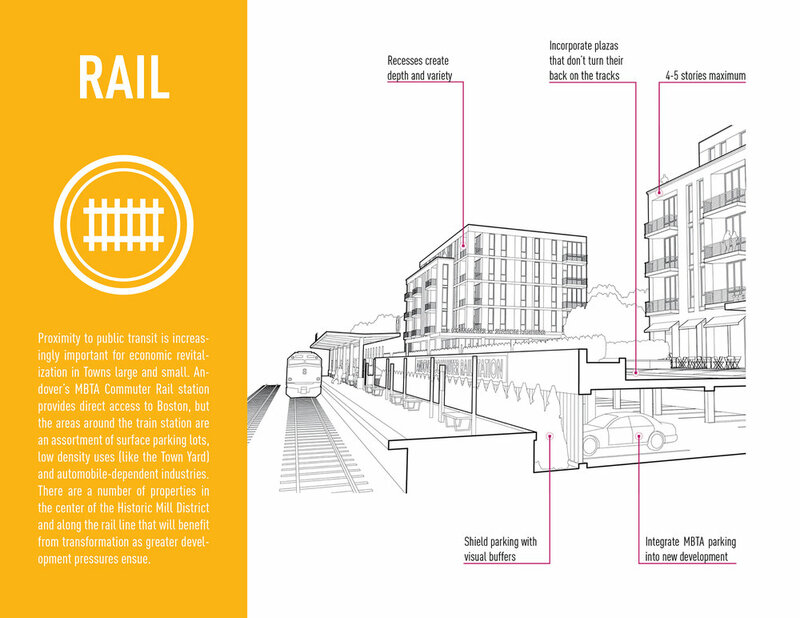 The Master Plan celebrates the site’s adjacency to the MBTA commuter rail station, which others quick connections to Providence and Boston, by adding a gateway mixed-use building on Main Street and increasing the density around the overhauled station. Green fingers bring the brand new Riverfront Park into the site and other physical and visual connections to the Ten Mile River. Parking is located next to the railroad tracks, shielded by higher building forms that step down towards the Park. Gamble Associates is providing architecture and planning assistance to the Department of Community Development in the City of Providence, RI. The former General Electric (GE) Base Works site is a brownfield property in close proximity to downtown and an emerging river trail. The site has been vacant for years when GE demolished the existing buildings. Response The reuse plan creates a series of development parcels that limit the viability for big-box retail. An open space network is established that enhances view corridors and ensures greater connectivity. The city is preparing an RFP process for development based on the framework plan. Envisioning the scale and character of new development is an essential component of helping people understand what a physical environment can look like. 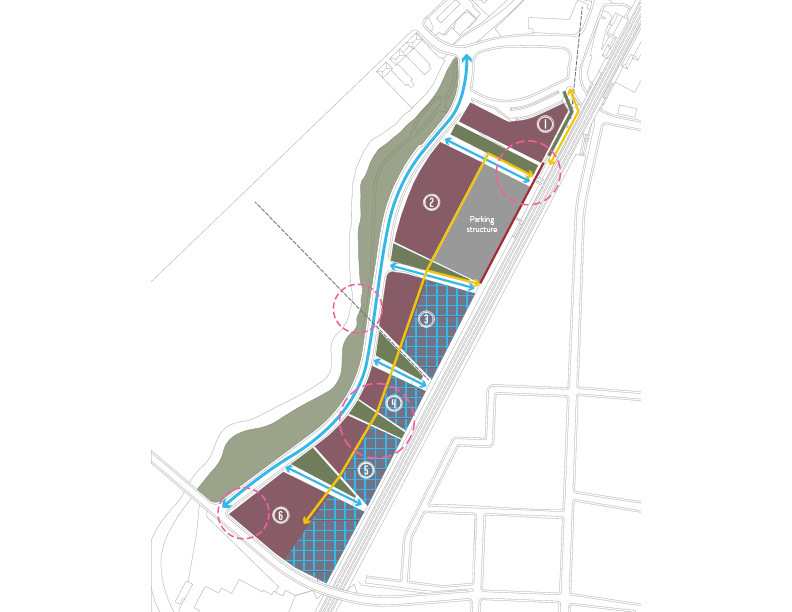 As part of the Town of Arlington’s Comprehensive Plan, Gamble Associates provided architecture and urban design expertise to test the development implications of three critical sites along the primary commercial corridors of Mass. Ave. and Broadway. The studies were informed by input provided by the community about the preservation of open space, the integration of mix-use and the sensitivity between existing buildings and new development. The City of Providence received a HUD Community Challenge Planning Grant to conduct the Transportation Corridors to Livable Communities project. Through the project, the City seeks to enhance transit, land use, and art and cultural opportunities along the five highest ridership bus routes in the city. Working with the Rhode Island Public Transit Authority to improve bus service, detailed corridor studies were developed to build upon the place-making role of transit by encouraging transit-oriented development. 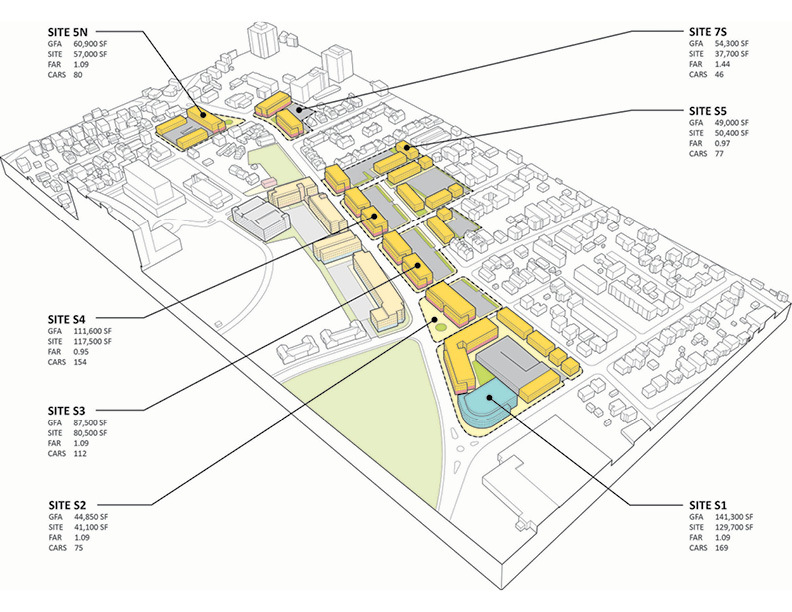 Along each of the five project corridors, community hubs were identified as areas where increased building height and density could be accommodated in order to encourage life and vitality, while also allowing for compatible transitions to surrounding areas. Vacant and underutilized land within these hub locations creates opportunities for transit-oriented infill development and redevelopment that will be tied directly to enhanced bus stops. Downtowns need to capitalize on their intrinsic assets. Jasper, Indiana is fortunate to have an intact historic Courthouse Square and many large, formerly industrial buildings that are vacant and in close proximity to both the Square and the Patoka River. The first catalytic project in the implementation of the Master Plan enhances the design of the Courthouse Square itself, adding new seating, lighting and sustainable landscape strategies to the space. The second implementation project forms a critical mass of new downtown activity through the reuse of the former Hoosier Desk complex, one of three vacant mill buildings along the Patoka River. 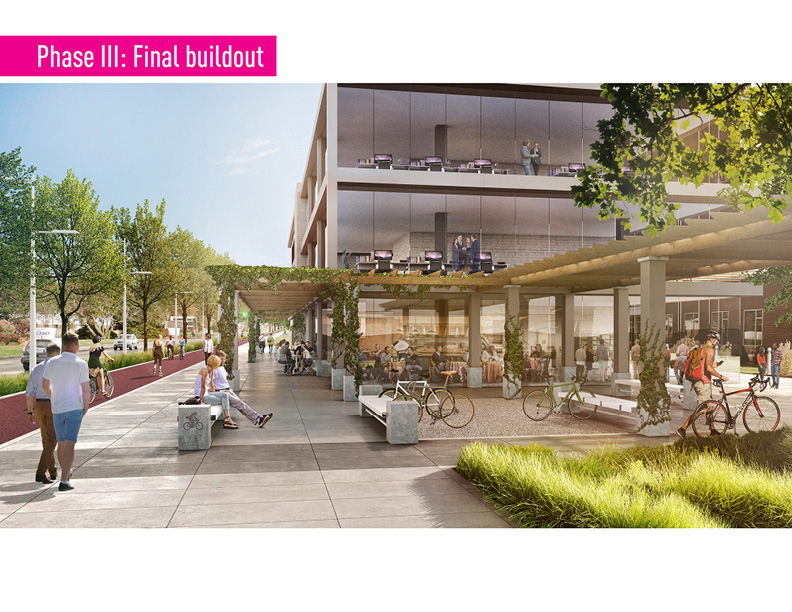 The 130,00sf complex has been identified as a new Arts and Culture Campus that brings together library uses, performing and fine arts, 36 units of housing, a restaurant, cafe and additional amenities. 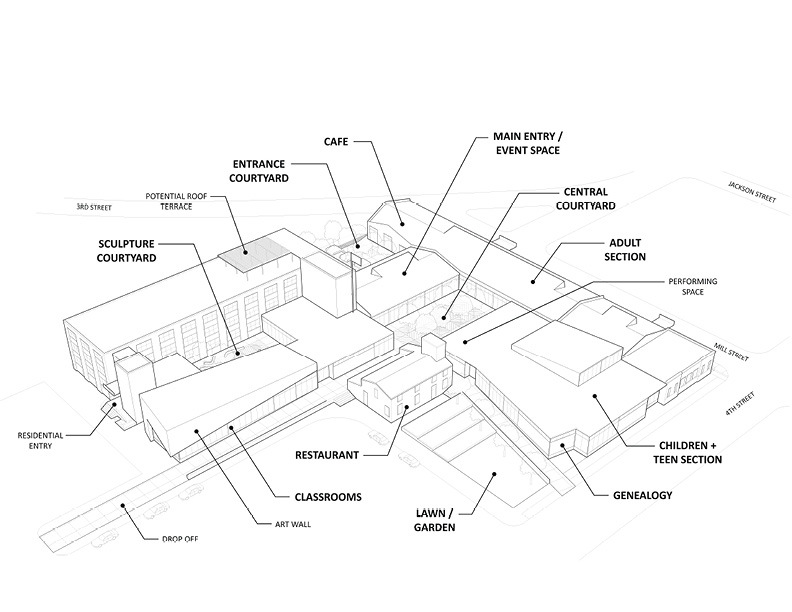 The new uses are organized around a series of courtyards that bring natural light into the complex, improving wayfinding and offering opportunities for revenue-generating events associated with the new uses.